She’s my little sister. She’s a nurse, a runner, a kind and gentle soul, a former beanie baby collector, and the object of my envy when it comes to decorating baked goods. Guess who made this beautiful, meticulous fruit pizza? It wasn’t my frosting-covered fingers. And by she’s cute, I did not mean she’s single. That super-happy-yet-tough-looking guy wearing the gym shorts and holding the burned DVD is her husband. And it’s a burned DVD of their wedding ceremony. Very not single. So let me tell you about Kristin’s fruit pizza. It starts with a slightly doughy jumbo sugar cookie, which already seems like it can’t get any better, but buckle up. It’s about to get WAY wild in here. The jumbo sugar cookie is intentionally underbaked so it stays nice and soft and doughy. Then it’s topped with a cream cheese glaze – repeat: cream cheese glaze – and then it’s decorated with juicy colorful fruit in a meticulously perfect pattern. Meticulous and perfect. That’s why she’s the baked goods decorator. I’m just the eater who goes into a sugar coma for 3 days and comes out asking for more fruit pizza. Like, whoa. This stuff is guuud. 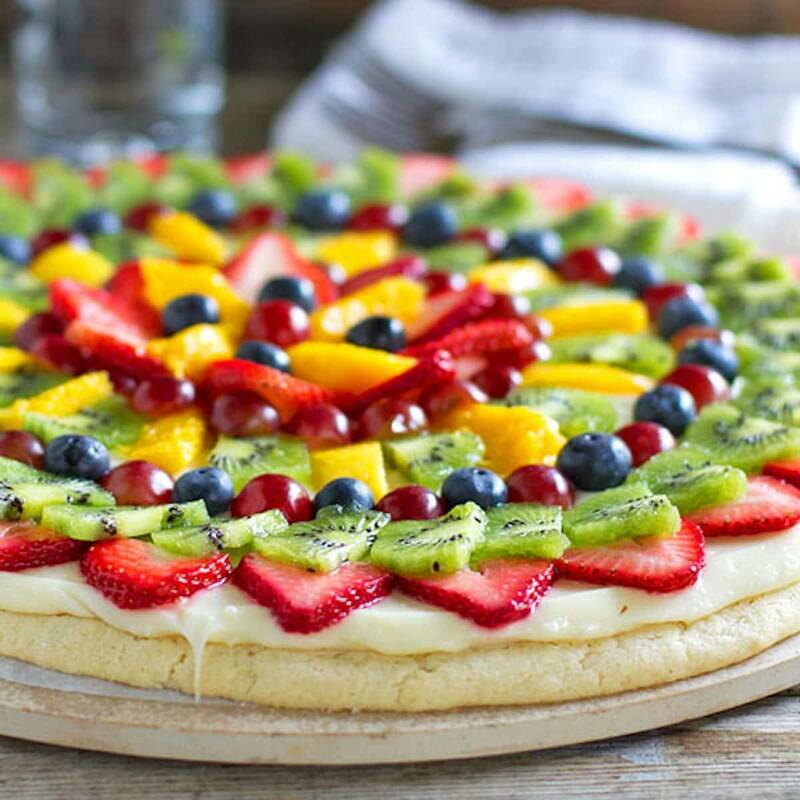 This simple fruit pizza is beautiful and delicious! A soft sugar cookie crust with a cream cheese frosting and topped with sliced fruit. Beat the butter and 1 1/2 cups sugar together in a large bowl until fluffy, 3-5 minutes. Add vanilla and eggs and mix until combined. Add the dry ingredients (flour, baking powder, salt) and mix until just combined, about 30 seconds. Chill the dough. Preheat oven to 350. Roll chilled dough into one big cookie and place on a round baking stone. Sprinkle with 2-3 tablespoons sugar. Bake for 17-20 minutes. Let cool; chill in fridge. Mix frosting ingredients together and spread on chilled cookie. Chill again to set and thicken the frosting. We LOVED that the dough was slightly underbaked, but if that’s not your thing, bake the dough for an additional 5-10 minutes. We’re packing up our house this weekend. So far, packing up our house has meant that Bjork puts things in boxes, I look at him with puppy dog eyes and he looks at me with a firm stare, and then later when he’s on the phone with AT&T trying to figure out a way for us to keep our iPhones in the Philippines, which, by the way, is INSANELY difficult but well worth the battle, I take stuff out of the boxes and put it back where it belongs. Marriage is a beautiful thing, really. Oh my gosh! This IS so good! I used to have a friend that would make it for Easter brunch and she’d use lemon curd as the frosting. SOOOO GOOOOD – and she did a beautiful decorating job! Your sister is SOOOO talented! I cannot believe how beautifully that fruit is arranged! I seriously am in awe. And what gorgeous pictures, Lindsay. I love everything about this post! I use this recipe but also add an envelope of powdered piña colada mix to the frosting. Adds a new dimension of flavor without taking away from the fruit flavor of the dessert! I think you have to “jailbreak” your iPhone. Google that term and you should be able to find directions. I’m not savvy or brave enough to try it. Ooh, sounds so … dangerous. I like it. Your little sister makes this look beautiful. I am looking forward to making this for my husband and 2 children. You can certainly tell you and your sister are the best of friends, so sweet. Marriage is a beautiful thing and so is friendship. I am sure you and your sister are going to miss each other tremendously. Thank goodness for cell phones, and facebook. I like your little story and look forward to making this very soon. I am sure it is totally fabulous!☺ Thanks for sharing. I came for the yummy looking fruit pizza from foodgawker and ended up laughing at your prose about your sister – you guys are funny! Lindsay this is beyond stunning!!! I remember eating fruit pizzas growing up. I need to make it. It looks fantastic. This fruit pizza looks soo cool! I am definitely going to have to try this. That pizza is gorgeous!!! I am not that meticulous and more of a collager, but I bet the pizza would still taste great! I don’t have a fruit pizza recipe and I am super excited to find one! This is gorgeous!! I’ve always wanted to try a dessert pizza. I don’t know how much I can help but I wanted to tell you that I’m using my Verizon iPhone here in Germany with a German sim card and number. Before I left California, all I did was call Verizon customer service and they unlocked the phone for me. I think AT&T should be able to do that for you too? First time fruit pizza maker here, and it turned out delish! I keep going to the fridge to nible on it. Again and again. Ah! One note though, in your recipe you list baking powder in the ingredients and then in the instructions you write baking soda. It confused me so I had to look up other sugar cookie recipes to figure it out. Hey! What a wonderful recipe! Just wondering if you think this could withstand June weather. I’m thinking of making this for an outdoor party and it has to rival a plethora of other baked goods. Would it hold up in the heat? I made something similar years ago, but this is just spectacular! For transport to the party or picnic, ask your local pizza restaurant if they’ll give you a box. Worked for me. This looks amazing!! 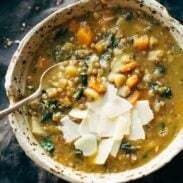 It sounds absolutely delicious and is VERY well put together!! WOW!! How long do you chill the dough??? It would be VERY helpful to have that timing in the recipe instructions. Thanks!